My wife and I both work full time jobs. I am actually the luckier one as I only have to work 5 days a week where my wife works 6 days a week being an assistant regional manager. With so little time for ourselves, you don’t want to spend it cleaning your house. Everyone needs a clean house, but if it consumes your valuable time you should make a plan. We needed something that met our needs. The right person as we are very cautious. To not worry about an employee, tax, labour law and all the paperwork that comes with that. That is where Sweep South came into the picture. They met all of our needs. They are the Uber of maids. Charging only R38 per hour for a “trusted, experienced and insured cleaner. 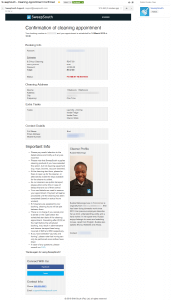 Cleaners are background-checked, fully insured and rated by their clients.” They have an extremely simple booking system which works perfectly. A dirty house needing cleaning. 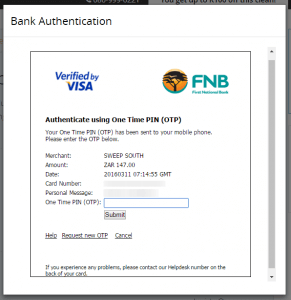 A credit card (If you don’t have a credit card, please follow this tutorial to get one without the credit from Capitec Bank). 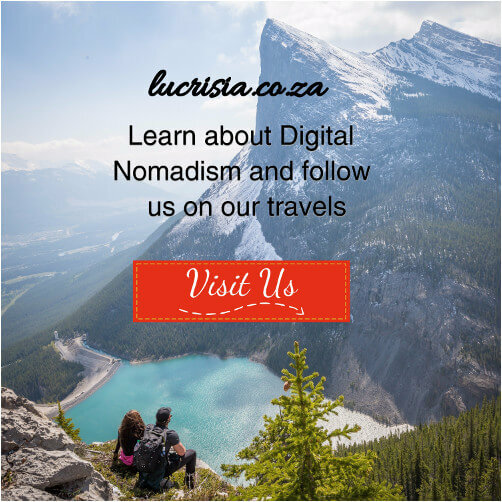 You need to live in Cape Town, Johannesburg, Centurion or Pretoria. 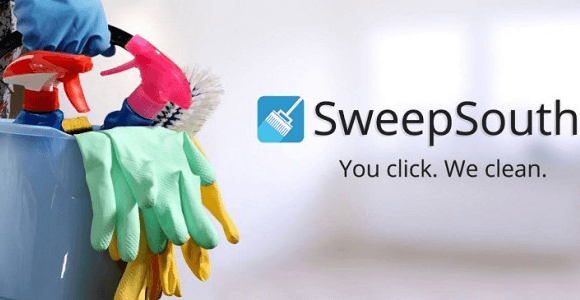 How to use the Sweep South Domestic Worker service to keep your house clean while working a full time job. 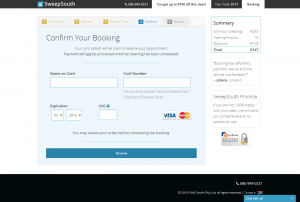 Visit SweepSouth.com by clicking on the link. Your R100 discount will be added for you automatically. Select how many bedrooms and bathrooms you have. Select other tasks that the maid should attend to. Leave the cleaning time as it is, because it’s just an estimate. Select whether you or Sweep South should supply the cleaning products. 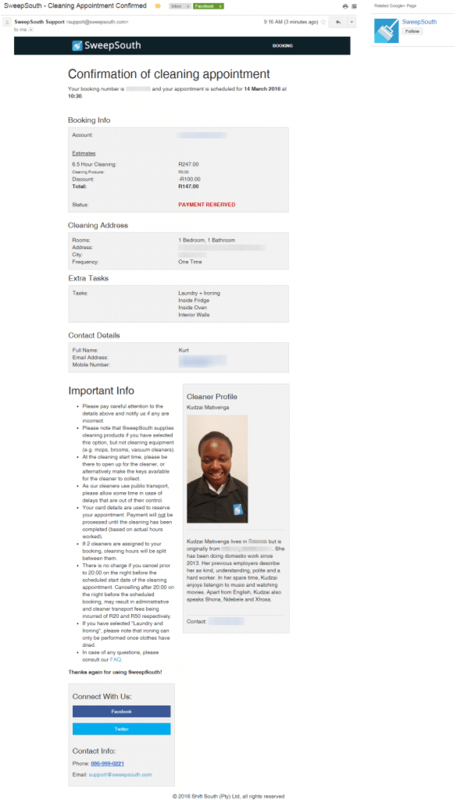 Fill in your personal details and address. Make sure you provide an accurate street address and house/unit number. Select a date and time when the clean should happen. Select how often the cleaning should take place. Hint: Select One Time if it’s only once. Confirm your booking by adding your credit card details here. 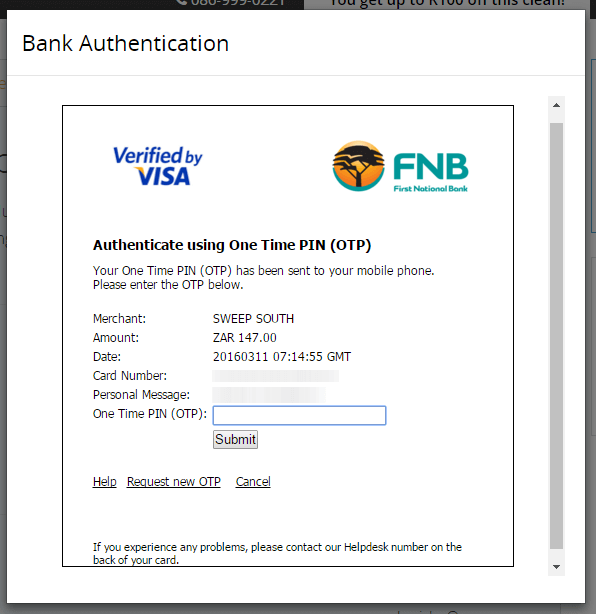 If you don’t have a credit card, please follow this tutorial to get one without the credit from Capitec Bank. Review the information you have provided and make sure it is correct. To complete this step click Book Appointment. If your credit card has 3D Secure then you will need to insert your One Time Pin. Otherwise you can skip this step. Congratulations, your booking has been confirmed! 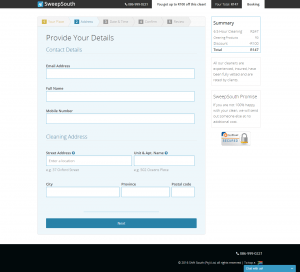 Now select whether you will be home or if you will make other arrangements, type it in the textbox provided. Specify whether you have any pets. A popup will appear confirming that your booking is complete and informing you to check your email. In the email you will find an overview of your booking, important information and a bio of the professional cleaner that will clean your home. Receive R100 off your first clean wtih Sweep South! 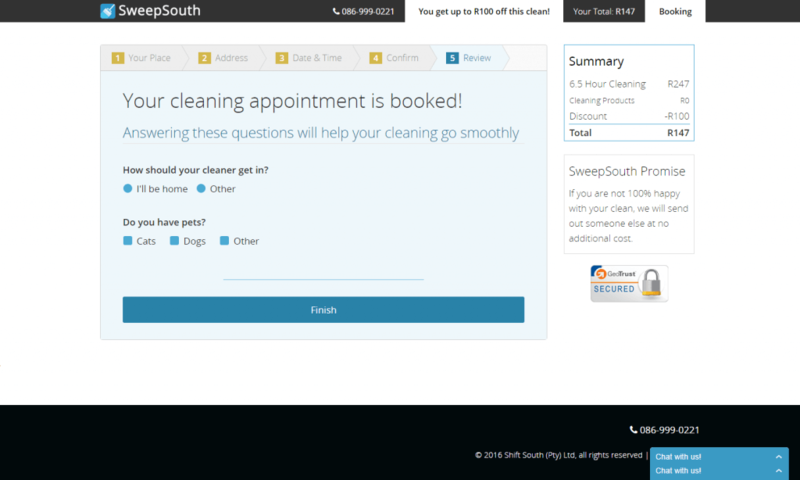 I’m a big fan of companies that push boundaries and innovate and Sweep South is definitely one of them. If you haven’t tried them yet, I highly recommend that you do! Let me know how your experience with Sweep South went in the comments below. I think I am going to try that one, what with 2 kids and a full time job! I don’t see Waverly on the Sweep South list, but Murrayfield is. Have you contacted them directly? Hi Carla, thanks very much for your interest. We’re sorry that you were unable to find a cleaner in your area. We have recently expanded to the 0184 (Murrayfield) area and we have been operating in the 0186 (Waverley) area for some time. 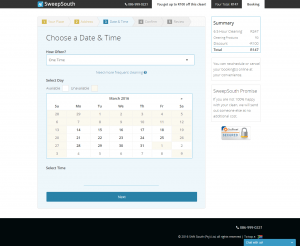 We were quite constrained for availability in early January but as our SweepStars have returned from their Christmas breaks, you should have no problem finding availability if you try booking again.